Hitec Zang offers a wide range of turnkey solutions, single components and services for the laboratories, pilot-plants and mini-plants for the chemistry, pharmacy, biotechnology and food sectors. The product ry range includes everything required for research and development with small reactor systems. Hitec Zang LabManager systems have become established as a quasi-standard for laboratory automation in the field of research and development. An interdisciplinary team of specialists in the fields of chemistry, process engineering, bio process engineering and automation technology provides support and consultation for all customers. The LabManager system is an automation and/or process control system for laboratories, mini and pilot-plant equipment. It is suitable for the automation of virtually all chemical-procedures reaching from batch, semi-batch and continuous processes. The LabManager system was developed in close cooperation with specialists from laboratories and pilot plant stations of major chemical companies. It has proved its worth in a great number of areas as a standard tool. In accordance with the requirements of the NAMUR Working Party for research process control computer systems (RPCCS), particular care has been directed to develop a user-friendly HMI. A compact design, and a high application flexibility.The LabManager RPCCS is especially distinguished by the fact that it is also transparent and easy to handle for personnel inexperienced in automation technicians even if they want to go into details. With help from the graphically programmable recipe control system HiBatch and a unit operation library, a customer without automation-technical knowledge can program the control program for a complex synthesis in a few minutes. The LabManager systems usually have a pay-back period below one year! Automated laboratory reaction systems are an absolute necessity for today’s product and process development and optimisation. Due to the much more intensive utilisation of the laboratory resources and the relief of the laboratory staff from routine activities, they can pay off very quickly. They are a sure way to achieve maximum reproducibility, an increase of quality and gain new knowledge. 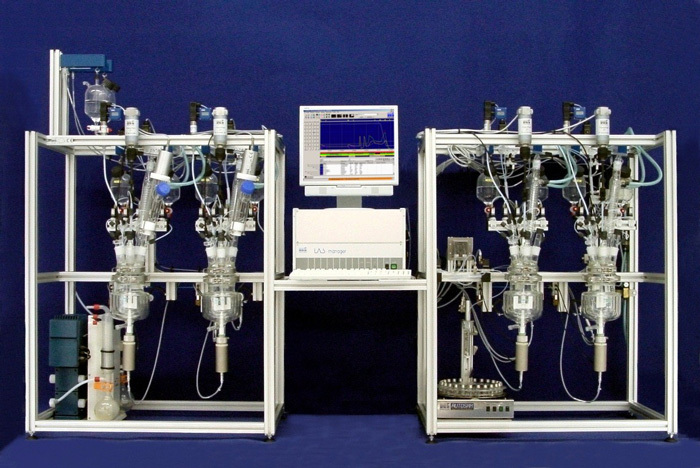 Conventional laboratory reactor automation systems are limited to simple syntheses and are therefore no longer able to meet today’s requirements. The fully-automated Hitec Zang laboratory reactor systems are available as single and parallel reactor plants. Apart from the standard configurations, you can choose the set-up of the plant which accords to your demands from the LabKit program. Hitec Zang offers laboratory devices and components which are optimally suited for our automation systems and the fields of application laboratory, pilot plant and mini-plant.